Women There are 192 products. 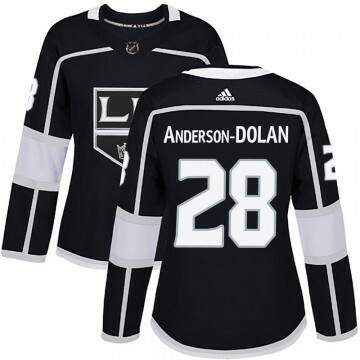 Let everyone know you're the #1 Los Angeles Kings fan when you sport this Authentic Adidas Women's Jaret Anderson-Dolan Los Angeles Kings Home Jersey - Black! The perfect complement to your Los Angeles Kings wardrobe, this jersey is sure to turn heads. Let everyone know you're the #1 Los Angeles Kings fan when you sport this Authentic Adidas Women's Adrian Kempe Los Angeles Kings Home Jersey - Black! The perfect complement to your Los Angeles Kings wardrobe, this jersey is sure to turn heads. Let everyone know you're the #1 Los Angeles Kings fan when you sport this Authentic Adidas Women's Alec Martinez Los Angeles Kings Home Jersey - Black! The perfect complement to your Los Angeles Kings wardrobe, this jersey is sure to turn heads. Let everyone know you're the #1 Los Angeles Kings fan when you sport this Authentic Adidas Women's Alex Iafallo Los Angeles Kings Home Jersey - Black! The perfect complement to your Los Angeles Kings wardrobe, this jersey is sure to turn heads. Let everyone know you're the #1 Los Angeles Kings fan when you sport this Authentic Adidas Women's Anze Kopitar Los Angeles Kings Home Jersey - Black! The perfect complement to your Los Angeles Kings wardrobe, this jersey is sure to turn heads. Let everyone know you're the #1 Los Angeles Kings fan when you sport this Authentic Adidas Women's Butch Goring Los Angeles Kings Home Jersey - Black! The perfect complement to your Los Angeles Kings wardrobe, this jersey is sure to turn heads. Let everyone know you're the #1 Los Angeles Kings fan when you sport this Authentic Adidas Women's Custom Los Angeles Kings Home Jersey - Black! The perfect complement to your Los Angeles Kings wardrobe, this jersey is sure to turn heads. Let everyone know you're the #1 Los Angeles Kings fan when you sport this Authentic Adidas Women's Derek Forbort Los Angeles Kings Home Jersey - Black! The perfect complement to your Los Angeles Kings wardrobe, this jersey is sure to turn heads. Let everyone know you're the #1 Los Angeles Kings fan when you sport this Authentic Adidas Women's Drew Doughty Los Angeles Kings Home Jersey - Black! The perfect complement to your Los Angeles Kings wardrobe, this jersey is sure to turn heads. Let everyone know you're the #1 Los Angeles Kings fan when you sport this Authentic Adidas Women's Jeff Carter Los Angeles Kings Home Jersey - Black! The perfect complement to your Los Angeles Kings wardrobe, this jersey is sure to turn heads. Let everyone know you're the #1 Los Angeles Kings fan when you sport this Authentic Adidas Women's Jonathan Quick Los Angeles Kings Home Jersey - Black! The perfect complement to your Los Angeles Kings wardrobe, this jersey is sure to turn heads. Let everyone know you're the #1 Los Angeles Kings fan when you sport this Authentic Adidas Women's Kelly Hrudey Los Angeles Kings Home Jersey - Black! The perfect complement to your Los Angeles Kings wardrobe, this jersey is sure to turn heads. Let everyone know you're the #1 Los Angeles Kings fan when you sport this Authentic Adidas Women's Kyle Clifford Los Angeles Kings Home Jersey - Black! The perfect complement to your Los Angeles Kings wardrobe, this jersey is sure to turn heads. Let everyone know you're the #1 Los Angeles Kings fan when you sport this Authentic Adidas Women's Marcel Dionne Los Angeles Kings Home Jersey - Black! The perfect complement to your Los Angeles Kings wardrobe, this jersey is sure to turn heads. Let everyone know you're the #1 Los Angeles Kings fan when you sport this Authentic Adidas Women's Marty Mcsorley Los Angeles Kings Home Jersey - Black! The perfect complement to your Los Angeles Kings wardrobe, this jersey is sure to turn heads. Let everyone know you're the #1 Los Angeles Kings fan when you sport this Authentic Adidas Women's Robyn Regehr Los Angeles Kings Home Jersey - Black! The perfect complement to your Los Angeles Kings wardrobe, this jersey is sure to turn heads. Let everyone know you're the #1 Los Angeles Kings fan when you sport this Authentic Adidas Women's Rogie Vachon Los Angeles Kings Home Jersey - Black! The perfect complement to your Los Angeles Kings wardrobe, this jersey is sure to turn heads. Let everyone know you're the #1 Los Angeles Kings fan when you sport this Authentic Adidas Women's Tiger Williams Los Angeles Kings Home Jersey - Black! The perfect complement to your Los Angeles Kings wardrobe, this jersey is sure to turn heads. Let everyone know you're the #1 Los Angeles Kings fan when you sport this Authentic Adidas Women's Trevor Lewis Los Angeles Kings Home Jersey - Black! The perfect complement to your Los Angeles Kings wardrobe, this jersey is sure to turn heads. Let everyone know you're the #1 Los Angeles Kings fan when you sport this Authentic Adidas Women's Tyler Toffoli Los Angeles Kings Home Jersey - Black! The perfect complement to your Los Angeles Kings wardrobe, this jersey is sure to turn heads. Let everyone know you're the #1 Los Angeles Kings fan when you sport this Authentic Adidas Women's Adrian Kempe Los Angeles Kings USA Flag Fashion Jersey - Black! The perfect complement to your Los Angeles Kings wardrobe, this jersey is sure to turn heads. Let everyone know you're the #1 Los Angeles Kings fan when you sport this Authentic Adidas Women's Alec Martinez Los Angeles Kings USA Flag Fashion Jersey - Black! The perfect complement to your Los Angeles Kings wardrobe, this jersey is sure to turn heads. Let everyone know you're the #1 Los Angeles Kings fan when you sport this Authentic Adidas Women's Alex Iafallo Los Angeles Kings USA Flag Fashion Jersey - Black! The perfect complement to your Los Angeles Kings wardrobe, this jersey is sure to turn heads. Let everyone know you're the #1 Los Angeles Kings fan when you sport this Authentic Adidas Women's Anze Kopitar Los Angeles Kings USA Flag Fashion Jersey - Black! The perfect complement to your Los Angeles Kings wardrobe, this jersey is sure to turn heads. Let everyone know you're the #1 Los Angeles Kings fan when you sport this Authentic Adidas Women's Butch Goring Los Angeles Kings USA Flag Fashion Jersey - Black! The perfect complement to your Los Angeles Kings wardrobe, this jersey is sure to turn heads. Let everyone know you're the #1 Los Angeles Kings fan when you sport this Authentic Adidas Women's Derek Forbort Los Angeles Kings USA Flag Fashion Jersey - Black! The perfect complement to your Los Angeles Kings wardrobe, this jersey is sure to turn heads. Let everyone know you're the #1 Los Angeles Kings fan when you sport this Authentic Adidas Women's Drew Doughty Los Angeles Kings USA Flag Fashion Jersey - Black! The perfect complement to your Los Angeles Kings wardrobe, this jersey is sure to turn heads. Let everyone know you're the #1 Los Angeles Kings fan when you sport this Authentic Adidas Women's Jeff Carter Los Angeles Kings USA Flag Fashion Jersey - Black! The perfect complement to your Los Angeles Kings wardrobe, this jersey is sure to turn heads. Let everyone know you're the #1 Los Angeles Kings fan when you sport this Authentic Adidas Women's Jonathan Quick Los Angeles Kings USA Flag Fashion Jersey - Black! The perfect complement to your Los Angeles Kings wardrobe, this jersey is sure to turn heads. Let everyone know you're the #1 Los Angeles Kings fan when you sport this Authentic Adidas Women's Kelly Hrudey Los Angeles Kings USA Flag Fashion Jersey - Black! The perfect complement to your Los Angeles Kings wardrobe, this jersey is sure to turn heads. Let everyone know you're the #1 Los Angeles Kings fan when you sport this Authentic Adidas Women's Kyle Clifford Los Angeles Kings USA Flag Fashion Jersey - Black! The perfect complement to your Los Angeles Kings wardrobe, this jersey is sure to turn heads.